I have switched what I was feeding and transitioning slowly to TRUDOG BEEF FEED ME. Its 99 percent pure beef from U.S.A grass fed beef and freeze dried with meat, the organs, and even finally ground beef bone. The perfect food never been recalled and voted the best in 2017. Expensive to say the least but worth every penny. Made mostly for the small breeds because of the cost but you also feed less. My 16lb Shih Tzu gets 2/3 cup,or less If I add some veggie content or meat myself. The total cost per month for what she needs is $78 but when you divide that into four weeks its less than $20 a week, and you cant find better food. That cost is for 2 1/2lbs, check it out, read the ingredients, best product currently around. For teeth I purchase USA beef knee knuckle bones hard and big enough she can't splinter it and cause internal issues. She gnaws on that a couple months then I just refreshen it with a new one and her teeth are SNOW WHITE. So I hope this gets posted as I no longer use FROMM, and while transitioning she would pick around the FROMM and eat the TRUDOG BEEF FEED ME first. Good luck with your dogs. Canned food is mostly made up of water and junk food fatteners,and by feeding it to your dogs, it also coats the teeth with plaque that turns to tartar. 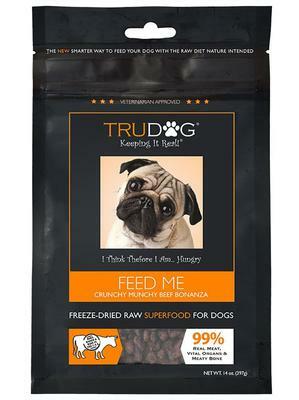 Maybe the first problem is your feeding Caesar..try the TRUDOG FEED ME BEEF. One way I would lean a dog into eating dry is..barely wet the dry food with a type of gravy just enough to say its wet and not swimming in a liquid. Maybe even a few drops of chicken fat drizzled over the dry food. Then be patient, and get rid of the can dog food which is never a good thing to feed in my opinion it fattens a dog with useless ingredients and most are attracted to it only because of the smell/stink, of it. It also makes for messy poops and a gassy dog. You would also be shocked if you ever truly researched whats in can dog food there just is not quality screening as to what gets in the ground up mix. And last your dog is saying it doesn't like what your feeding it if its fussy. TRUDOG FEED ME BEEF its the way to go...expensive yeah but you feed less and get more for your dog. Your dog will immediately know it just got served steak so to speak and not a cheap hot dog..lol. 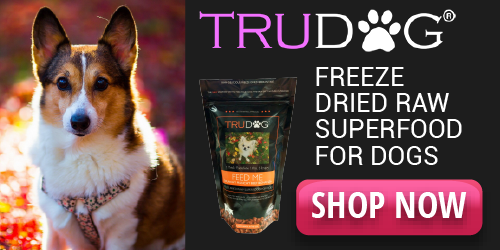 Thanks for your input, I had not heard of TruDog Feed Me before. Looks like my boys may be trying something new. Molly, I promise, something I RARELY do...neither you or your dogs will regret your decision should you actually switch...and no thawing...actually improves many health issues some dogs have...so less worries...fewer vet calls...less expense with medications etc...it says to add water, but they also LOVE it dry...I know I sound like a spokes person for this dog food and affiliated to them but I promise I am just a very satisfied customer and my dog Jasmin is quite happy with this food. Be sure to let me know how it works out should you make that all important decision to switch.